What if things had turned out differently for Mike Carlton and he had become a naval officer instead of a journalist and author? It’s something he still wonders about as he tells Paula Grunseit during a conversation on all things naval history – plus his latest book, First Victory: 1914 – HMAS Sydney‘s hunt for the German raider Emden. “I’ve wanted to join the Navy from about the age of 11 when I first read the Nicholas Monsarrat novel The Cruel Sea,” says Mike Carlton. “I found it on my parents’ shelves and I read it under the bedcovers with a torch when I was supposed to be asleep. I was transfixed by it. I’m quite sure I didn’t understand a lot of it but the narrative got me and the story of the battle of the Atlantic in the Second World War with U-boats and submarines — it absolutely grabbed me. I must have read it about 200 times since then because it’s still my favourite book. I can quote you passages from it. It awakened in me the immature desire as a kid to stand on spray swept bridges and command destroyers and sink U-boats and that was the first sparking of a love of naval history. Over the coming years I realised what a fabulous field of study it was,” he says. Having developed his love and aptitude for history at school, Carlton has written two books about great ships and their crews. Cruiser: The Life and Loss of HMAS Perth and her Crew traces the extraordinary stories, adventures and fates of the Australian crew of HMAS Perth, most of them very young men, who fought during World War Two against the Nazis, the Italian fascists, the Vichy French, and the Imperial Japanese Navy. Some were captured by the Japanese and became labourers on the Burma-Thai railway. Only a third of the crew survived to return home at war’s end. 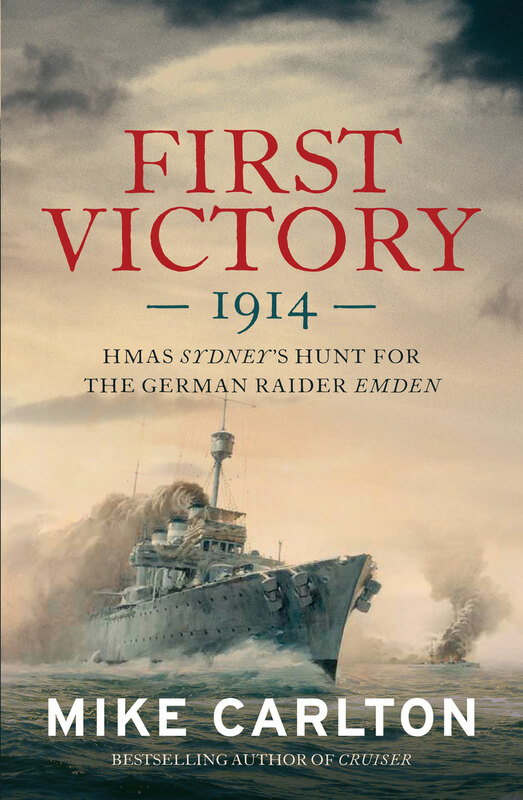 First Victory, published in 2013, tells the incredible story of the bloody battle between HMAS Sydney and the German raider Emden at the Cocos Islands in the Indian Ocean on 9 November 1914. Carlton says: “I’ve always wanted to write something for the World War One Centenary. I’d known about the Sydney/Emden story for a while and it was the first great naval victory for the newly formed Royal Australian Navy (RAN). It’s never really properly been written by an Australian before. I don’t know why. There’d been a few historical bits and pieces, essays and so on but not a full account of it. It struck me that it was a good story but I didn’t know how rich it was until I got into it especially on the German side — that was the most fascinating thing of all actually because I got enormous cooperation from the German descendants of the Emden’s crew,” he says. With help from his friend retired rear admiral James Goldrick of the RAN, who is also one of the world’s great naval historians, Carlton was able to connect with the descendants of the Emden’s crew. “They have a very close-knit family association; they call it the Emden Family,” says Carlton. “They are a group of descendants of the crew run by Flottillenadmiral Henning Bess, a retired flag officer of the German Navy, and they could not have been more helpful.” Bess offered the author every assistance, translating for him, finding documents, and obtaining permissions to quote from letters. “They were all just terrific and I owe Henning a great debt,” Carlton says. Carlton found it exciting when he found his preconceptions challenged. As for the Australian side of the story, Carlton says: “The exciting thing is going to the War Memorial in Canberra and getting out the original documents — the ships logs from HMAS Sydney, the bridge log, the signal log. To hold the original documents or letters in your hand… HMAS Sydney had a young Lieutenant on board called Rupert Garsia who documented the battle in a long, long letter to his father and to actually hold that letter, not a copy of it but the actual fragile paper is an extraordinary thrill and an extraordinary privilege,” he says. Garsia’s father sent the letter on to the Times which published it anonymously on 15 December 1914. It represents the best Australian eyewitness account of the Battle of Cocos. Readers will be intrigued and surprised, as was the author, by how close the Germans actually were to attacking Australia. Carlton says: “The commonly held view is that World War One was a fight between the crowned heads of Europe and their arms makers and was of no real concern to Australia but it was of vital concern to Australia because the Germans were there in the Pacific and had distinct plans to make life very difficult for us. They were willing to shut down our trade and if need be bombard Sydney, Brisbane, and Melbourne to do it. I got into the network of German colonies in New Guinea and to the north and realised what a threat they were — they were very serious about it. So that was extraordinarily important and I thought it was worth making the point to Australians that we were threatened in the First World War, that we weren’t just off to fight the King’s enemies at Gallipoli and Northern France,” he says. “Brown doesn’t downplay the death and the sacrifice at Gallipoli but says it should not be centrepiece. It was another battle, it was a defeat. And in fact, it has distorted our view of what warfare is about and particularly about our care for the veterans of more recent wars like Afghanistan. I’m very pleased to see Gallipoli downplayed and to see other battles and other stories brought to the fore,” Carlton says. “I derived a lot of inspiration oddly enough from historical novelists and navy novelists like Patrick O’Brian who wrote the Master and Commander Aubrey-Maturin series and going back to The Cruel Sea and even the Hornblower stories. I tried to bring to the history I was writing some of the techniques of the novelist to make sure the story cracked along, that you wanted to turn the page to see what happens next and that’s really important to hold the reader,” he says. Despite the mountains of information and ease of availability that the Internet affords to researchers – for example all of the Kaiser’s speeches are online – Carlton says that nothing beats holding original documents, meeting people, and talking to descendants. Click on the cover for a free sample of the book. Mike Carlton will appear at the Byron Bay Writers Festival on Friday 1 August, joining Dr Clare Wright, James Brown and chair Russell Eldridge for a session called ‘History: A Work in Progress?’, sponsored by Inside History.